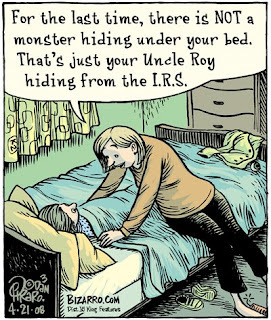 Today's Bizarro is brought to you by the Internal Revenue Service. "Your fear is our living." I usually post cartoons one week later, but somehow I got out of order earlier this week so this one is from the day I missed. Does anyone care? Me thinks not. grab-it theory of childhood bed behavior. More than once, I was certain I heard something under the bed. I wasn't the sort to believe in monsters (my parents always taught me there were no such things as monsters and ghosts, but there was a devil in Hell and millions of flying people with halos in Heaven – mixed message?) but I was concerned about murderers who might sneak into the house and wait for me to go to bed. Without my hanging a hand or foot over the edge, they'd be powerless, of course, and have to sneak out of the house in defeat. My parents were cool enough not to give me ANY delusions, religious or otherwise. However, their frankness may have been detrimental too, since they openly told me that the helicopters that regularly buzzed our house, shining bright search lights in the windows, were looking for escaped convicts, I was SURE those convicts were hiding out under the bed. I had to run and jump from as far as possible to get into the bed and then stay within its boundaries to avoid being grabbed. I think we care, we just don't know better :-) I rarely read any print dinosaurs anymore, only occasionally going straight to your panel in a copy of the mega-corporate daily rag masquerading as "news" tossed aside and left behind by someone in the break room, and you are my go-to source for the panels mostly...is there another online? I thank you for mentioning about keeping hands and feet in a safe place when going to sleep as a child. It brought back my childhood memories of keeping these extremities at a safe distance from whatever it was that roamed in my room at night. It must have worked because I still have all my fingers and toes. hah! i used to leap on to my bed from what seemed like 10 feet away when i was a kid to avoid the creepies under there. 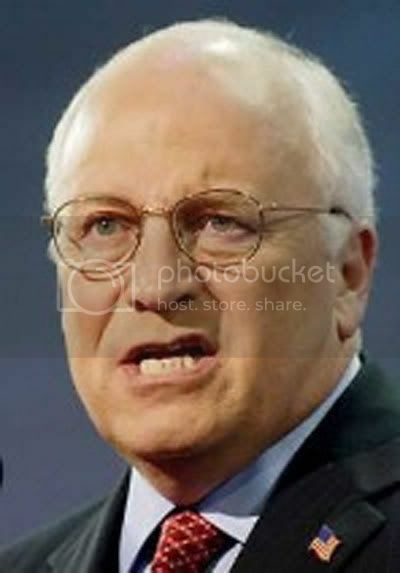 that's a scary monster picture you have there too man....i wonder, is his "undisclosed location" under some poor kid's bed? I just cut-out the middle man and sleep under my bed, killing anyone who dares alight atop it.